Manchester United will listen to offers for Wilfried Zaha, Bebe, Anderson, Marouane Fellani, Javier Hernandez, (update) Ashley Young, Tom Cleverly, Luis Nani, Nick Powel, Patrice Evra. Tom CleverleyTom was a midfielder who raised from Man United youth system. He was expected to be the next prince of Old Trafford replacing Paul Scholes. His first opening season with the club was okay, he made great assist and he also scored goals. However as the season come to the climax and the club began to loose its position in the league, Tom Cleverly become the scape goat. Speculation around him said that Everton will save him from the new Manager sweeping the dead woods. Brazilian midfielder Anderson Luís de Abreu Oliveira did not have his best time under David Moyes Reign and he agreed to move for Fiorentina last season. 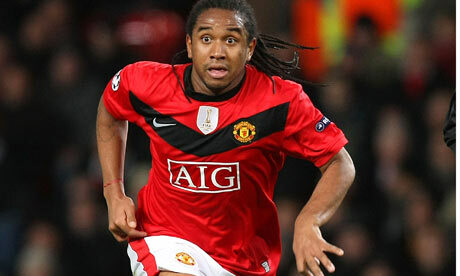 Ando was sign by Sir Alex in 2007 from Portuguese Porto. He is known for having good vision, good tackling ability and strength. However having only 8 games at Manchester United under David Moyes, the Brazilian midfielder chose his path to regain success as football player in Italy. When he came to Old Trafford Ashley Young was a flamboyant winger from West Ham United. The fans was having their great expectation to the young England winger. However for the last season he performed not as The Red Army’s expected. The new manager seem having the same understanding with the club fans with the rise of his transfer speculating. The news reported that West Ham are ready to bring him to the club again with another England winger Wilfried Zaha. Earlier this season Young get bullied by Man United fans after he tweets about the first game against Swansea. After signed Manchester United contract in 2013 Wilfried Zaha seem cannot established himself in Man United squad. He was signed in the last era of Sir Alex Ferguson reign in Old Trafford. David Moyes however loaned him to QPR for 2013/2014 campaign and if the scot still in charged Zaha considered to move and find other club to develop his game. Louis van Gaal has stepped up replacing the sacked David Moyes but Zaha future in Man United still unclear. Speculation arise that the winger will join Dynamo Kiev next season. Maybe Fellani will be the shortest player ever to play for Manchester United. He was signed from Everton last year when the club was still run by David Moyes. The Belgian cannot contribute to the team as expected. Personally I did not see that Fellaini fit to the team, he was slow and never get into the best position both in attacking and defending. I do not know the logical reason Moyes sign the Belgium aside for Fellaini was working well with him once they were at Everton. At Old Trafford Fellaini also missed the game due to his injuries which take a long time to recover. Southampton is in need for striker I guess but for Manchester United let this young man go to The Saint I guess that would be a wrong move. The striker is indeed do not have much time to play last season but every time he got to the pitch he proves to the fans and (should be) the manager that his abilities is not over. He could scored and still dangerous in penalty area. My personal opinion this man should get the opportunity to prove himself like he did in his first season at United. Arturo Vidal, Marco Reus, Mat Hummels, Angel Di Maria, (update) Yaya Toure, Daley Blind, and Ross Barkley. Having a champion side in Manchester United is a must. After the bad dreams last season at Old Trafford having Mats Hummels as The Reds center back should be number one priority. We have the young trio but Smalling, Evans, and Jones are need mentor to develop their winning mentality. I guess Hummels will provide that to the United defensive players.